It’s easy to make an argument to any cash-strapped producer that a free DAW is good news. And it’s easy to convince a free and open source software advocate that a free-as-in-freedom DAW is a good thing. But that’s not enough. If we’re going to talk about software, let’s make sure it’s worth using. Ardour, the free and open source DAW, has always been powerful. But it hasn’t always been seamless to use – especially outside of Linux. Ardour 1 and Ardour 2 were incredible feats of engineering, and some people used them to make music, but let’s be honest – outside developers and Linux nuts, you wouldn’t find a whole lot of users. Then Ardour 3 came along and added MIDI – but it still wasn’t quite ready for prime time. Ardour 4 is something different. It looks better – maybe not pretty, exactly, but easier on the eyes and more comfortable to use. It works better – loads of new functionality changes make it a more well-rounded tool. But most relevant to most people, you can now install it on Windows and OS X and have it behave like you’d expect a DAW to behave. It’s got a new UI. A bunch of graphics stuff has been reworked from the ground-up. There are more vectors, and everything is more modern. (vectors!) It’s also easier to switch color schemes. It’s now on Windows and OS X. It’s now on both operating systems. On the Mac, it’s moved from unofficial to official and supported status. It’s also more in line with what you’d expect from a Mac app: Audio Units work more smoothly on the Mac, and it looks actually really slick on a Retina Display. On Windows, you can get unsupported nightly builds – in other words, Windows is where the Mac was until recently. But on both, more native plug-in support and more flexibility with audio engines means you don’t have to feel like you’re running a Linux app on your OS of choice. You can use any audio engine. Yes, it works with the powerful JACK, but now also ALSA (Linux), ASIO (Windows), and Core Audio (OS X). Also, misbehaving plug-ins are less likely to cause crashes. It does VSTs.. With Windows support, you also get native VST support – and VST support is better on both Linux and Windows (Linux also has some nice plug-ins that use the VST format). It’s powerful for MIDI editing now. MIDI bounce, mix MIDI and audio data flow (as you might for a soft synth), edit modelessly, and make transformations more easily, among lots of other details. Ripple edits. (Move or delete and other stuff moves to fit – video editors know what I’m talking about.) Why don’t all DAWs have this again? More Control. QCon, original Mackie Control devices, AKAI MPK61, etc. Less Memory. 80% memory consumption reduction headlines the other performance improvements here. There are a lot of other tweaks and improvements, too, even down to SoundCloud export. You can easily shift the focus of while you’re editing – hugely quick. You probably have some sort of DAW at this point for some of your work. 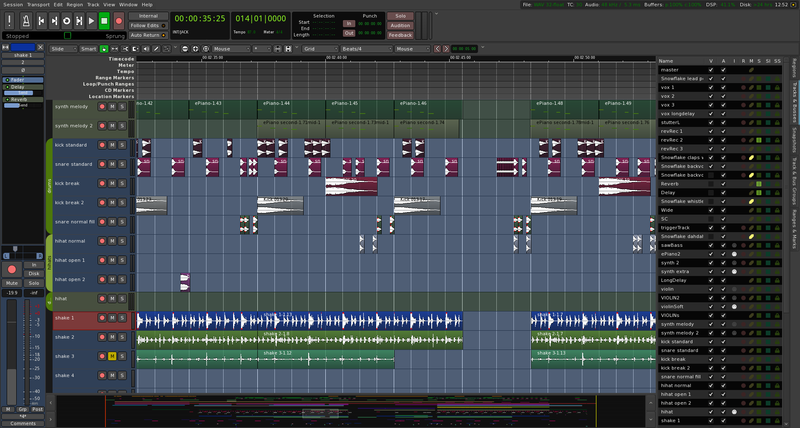 What you might not have is a DAW that works comfortably and reliably on any machine, including Linux, one that you can share with friends without worrying about who bought what, one go-to tool for quick editing and tracking when the others fail. 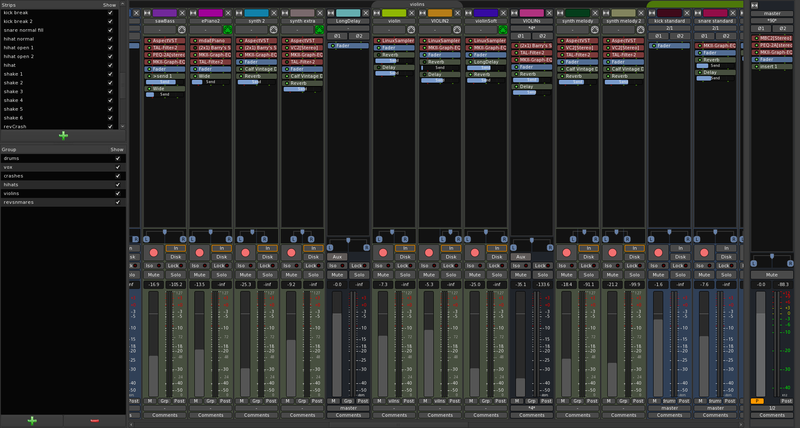 And with these improvements, Ardour could be that DAW. You can try it out for free – demos are free everywhere, and you can build from source. Or you can pay as little as US$1 to download a ready-to-run version. In fact, the growing success of Ardour shows some vastly improved numbers for the voluntary subscription/payment model. For just a couple of bucks a month, you can really have some impact on Ardour’s development and earn yourself access to support. It seems like a great means of funding the project – that is, now that Ardour is picking up some steam. I think it’s worth a few bucks and keeping around your drive, even if you have another DAW. Also, the brilliant Harrison Mixbus 3 will in the next version use the Ardour 4 base. 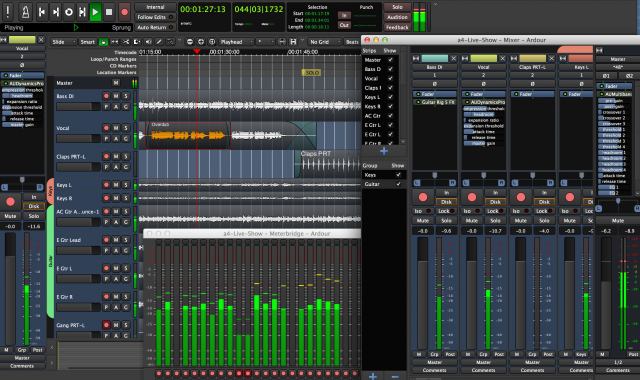 Check out Ardour, download a free demo, or pay to get a pre-built version – starting at just a buck.